Nevertheless, despite this lack of experience, none of us have any difficulty knowing what is meant by the term. It is not difficult for us because all of us have stumbled over something or another at some time in our lives. We know what a stumbling block is. I believe that the expression stumbling block is strictly a Biblical term, and to be technical about it, the word block has been added by the translators in an attempt to clarify the meaning for us. I do not know of any other literature that uses this idiom. The meaning, of course, is quite clear. It first appears in the book of Leviticus (19:14) where there is a prohibition of putting a stumbling block in the path of a blind man in order to trip him. By the time the phrase appears in the New Testament, this “tripping someone up” came to mean anything that would lead someone else to fall into sin. In Matthew 13, for instance, it is put into the context of the Kingdom of God as being the evil tires (or weeds) that had been planted among the good wheat, causing harm to the wheat crop. We can often see these sorts of stumbling blocks in churches today. These are the people who truthfully do not have any interest in knowing the way of the Lord, but instead consider the church as just another organization to belong to. In doing things and making decisions in the church, they do not consider the Word of God, but rely only upon their own opinions or the present culture of the day. Or, these people have certain things about their lifestyle that is in direct conflict with the teachings of the Bible. This causes confusion to those who are sincerely trying to learn how to walk with Jesus. The people who mislead these Christians are the stumbling blocks to the true believers. In this story about the wheat and the tares, Jesus talks about “the end of the age” when he will send his angels to gather all of these stumbling blocks to cast them into that place that place of punishment where there will be endless weeping and gnashing of teeth. This is the fate of those who live their lives as stumbling blocks. We can see that Jesus took this issue of being a stumbling block seriously indeed. This is especially so, it seems, when it comes to our influence upon children. Children naturally look to adults as role models. They look to their parents in particular, but they also look to all of us. It is understandable why they should do this. They know that they will one day be adults, so to whom else should they look? It is the adults in their lives that give them a guide as to what they should be like. Well… that may work for us for a while, were it not for one thing. That thing is the Holy Spirit. If there is something in our lives that is not according to the way that God wants us to live, the Holy Spirit has a way of letting us know. He points these things out to us and he does not let us rest. The truth be told, there are many things in all of our lives that are not as they should be, but the Holy Spirit does not simply say we are evil people, list all of our faults, and then tell us to change. It may be that this is how it is before we become believers in Jesus. We saw our lives as heading in an entirely wrong direction and understood that we need to change everything about it. The Holy Spirit convicts us of our sin and convinces us that we need to turn to God in our lives. This is the way that we become Christians after having lived only for the world and for ourselves. However, after we are believers, the Holy Spirit deals with us in a different way. It is not that our entire lives are heading in a wrong direction any more, but there are still things about our lives that are not right. These the Holy Spirit points out to us one at a time. He convicts us on one area of our life that we need to bring before Jesus, confess it to him, and ask him to help us in it. When we have victory in that area, the Holy Spirit shows us something else about our lives that we need to deal with. Does that sound like a lot of work? Well, it is…sort of. But more than work, it is freedom; it is growth. Freedom is sometimes difficult to obtain. Growth inevitably comes slowly, but it is worth the effort. It is worth the time. WARNING: This is a very sad story. If you cried when Ol’ Yeller died, you will cry with this one. You might ask me why I would write such a sad story, and the answer is, “I don’t know.” Most of the things that I write about farm life are happy things, because farming is a happy life for me. However, we have had a couple of sad things also happen this summer. Unfortunately, this is also part of farm life. It had been a hard year for our old cow Cora. I do not actually know how old she was. I bought her only about four years ago, but she was obviously very old even then. The shoulders of her front legs stuck out unnaturally, and had the look of being affected by a type of bovine arthritis. But it was not arthritis, and her ungainly look did not seem to give her any pain. It certainly did not inhibit her movement in any way. Despite being my oldest cow and despite her awkward appearance, I thought that she was the most beautiful cow that I had. She had long graceful horns that grew out of a forehead that was covered with long, light red, kind of frizzy hair. In the winter, the hair falling in front of her face fairly covered her eyes. I sometimes wondered how she could see. But see she did, and looking into a field of wind-driven snow never seemed to bother her. She was old, yes, but it was not her health this year that had been the difficult thing for her. To tell you about what I think led to her eventual death, I need to go back to the month of July. 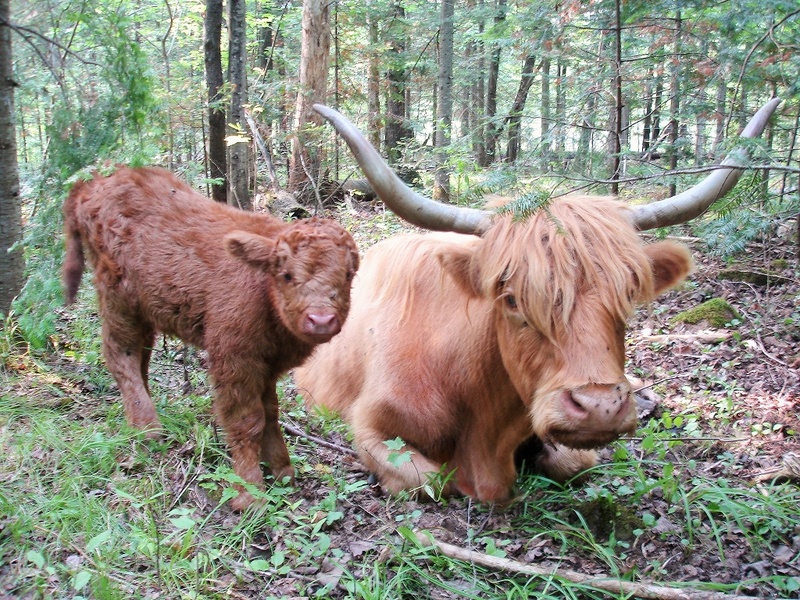 It was in July that her last calf was born. This is very late in the year to have a calf, but Cora was at the stage of life that breeding was perhaps getting a little unpredictable. But in July, at a time when all the other calves on our farm had been running and skipping around the fields for some time, Cora gave birth to a little heifer. immediately called “Corabelle.” Up until Corabelle was born, I had only gotten bull calves from Cora. Ever since I had bought her, I had been hoping for a heifer so that I could keep her line going. I don’t know why. I just liked Cora. We were all happy to see little Corabelle. Then, about a week and a half after Corabelle was born, disaster struck. 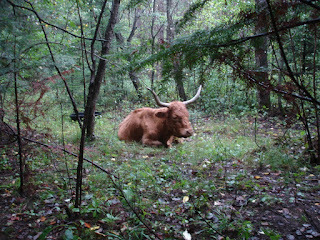 The disaster came one night in the form of several coyotes that attacked and killed the little calf as it lie sleeping. As you might imagine, this event pained me considerably, but even more so Cora (this is a separate story. You can read it at http://www.donaldrhody.com/2015/07/corabelles-death-in-wild.html ). Earlier this spring, I was not sure of my plans for Cora for later in the autumn. I knew she was very old, but I did want that little heifer from her. One of the things that I was thinking was that if she were to have a heifer this year, I may ship her to market later in the fall. I think that is what a good herdsman would have done. There could be no profit left in Cora in the future. I’m afraid that the longer that I am in this business, the less of a herdsman I am becoming. Then Corabelle was killed. But despite what I thought might be Cora’s sorrow, after the loss of her calf, Cora seemed to be doing pretty well physically. As a matter of fact, it was only a couple of weeks ago that I looked at how she had filled out. She looked sleek and fit. At one time during the summer I wondered if she would be able to make it through another one of our harsh, Wisconsin winters, but after looking at her that day, I thought that she would have no trouble. But in the end, it was not the cold that got her, it was the heat. This early September, we have been having unusually hot weather for this time of year. Temperatures in the high 80’s with humidity that exceeded even that. Our cows have already begun to grow their winter hair, and it has been very hard on them. Four or five days ago, I watched as the cows climbed the hill after getting a drink at the pond. They were moving pretty slowly. Then I noticed that Cora was not among them. A little concerned, I went to look for her. I finally found her standing in the shade in the valley, but panting rather hard. I actually was not bothered about it much at the time. Cora always panted in the summer. Vivian and I used to joke about it. As soon as the thermometer reached 70, Cora would start to pant. “It’s too hot for Cora,” we would laugh. When I saw her standing in the shade on the day I went to look for her, I gave Cora a rub on her hairy forehead and left her there. I fully expected that she would join the rest of the cows soon. The next day, there was still no Cora. Now I was concerned. Again, I went to look for her. She was not where I last left her, or nowhere in that area. I looked all over our little farm. I at first could not find her anywhere. Finally, I came upon her lying under some balsams in furthest point that she could find to be alone. She looked fine, but I knew that this was not a good sign. I had never watched a cow die before. Growing up on the farm, we never had a cow die of old age. We would always ship them before they got to that stage. That is what herdsmen do. But I already commented about my learning curve in being a herdsman. However, when I saw her lying at that place on our farm, I was worried. It was as if she had gone off to die. She rose to her feet when I came near, but she had the look about her that she was not interested in coming back up the hill to be with the others. I had brought a little feed in a bucket for her. She sniffed it and licked at it a little, but she was not interested. This was not like Cora. The day was hot and muggy. I had even replaced my standard-wear bib overalls with shorts that day, and just the act of walking around the farm soaked me and all my clothes with sweat. I walked back to the pond and got a pail of water for her, and she drank a little, but not much. Inside, I knew that Cora was dying. not really have hope that Cora would pull through. She knew that it was her time to die. I knew it too. Nevertheless, I kept tempting her with goodies. I walked back up to the farm and got her a nice bit of hay, just in case she should decide to eat a little. There was an apple tree in the woods near to where she lay, and I picked a couple of apples for her. She always loved apples and would gobble them down so fast I used to be afraid that she would choke on one; and I did not know how to do the heimlich maneuver on a cow. However, when I brought the apples to her this time, I held one up to her snout. She first took it in her mouth, but her appetite was gone. She let it drop to the ground. One night, after dark, I heard coyotes yipping in the direction where Cora lie. They were not near where she was lying, but I was afraid they might find her during the night. She would have no strength to fight them off. I took my revolver and walked carefully in the dark down the hill and through the balsams. There, a couple hundred feet from Cora, I aimed at nothing and emptied the cylinder of bullets into the tops of the trees. I hoped it would be warning enough for the coyotes to stay away. I don’t know if my shooting did anything, but at least they did not come that night. For three days Cora lie there. She sometimes drank a little water, but I don’t think she ate anything at all, or if she did, it was very little. But she seemed comfortable and always perked up a little when I came to see her. If it had seemed like she was suffering, I would perhaps have put her out of her misery. But she mostly seemed peaceful – just waiting for death to come. It was difficult for me, but I had wanted to let her die naturally, so that is what I did. This afternoon when I last went to check on her, I knew that she had died even before I got there. The last time that I saw her, I knew that death was very near. When I arrived at the spot, she lie still, flat on the ground. She was peaceful now. It is sad for me, but honestly, I don’t think it would be so sad except for the fact that she had to see her last calf killed by predators. I wanted to let Cora die a natural death, and that is what she did. My regret is that I did not want it to be this soon. 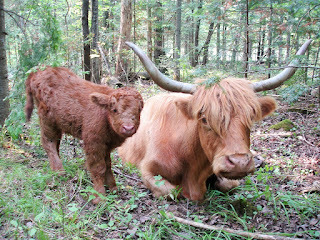 Vivian said that if the calf would not have been killed, Cora would not have died this year. Her little calf would have kept her alive. I think that she is right. I will miss Cora. Most mornings I look out on the fields to see the cows. Quite often, when the light was still dim and the cows were still lying on the ground from sleeping during the night, all that I was able to make out was Cora’s graceful horns sticking out of the fog. I do not know how Cora’s life was in the many years before she came to our farm, but I can say that she had a nice life here. All of our animals do, and despite the occasional heartache, that is one of the joys of our farm.